Guest Blogger, Ioannis Karampelas, PhD, CFD Engineer at Flow Science, contributed this article. Acoustophoretic particle focusing is a modern and very attractive method of removing a variety of objects from solutions in a microfluidic channel. The process is applicable to healthcare applications (e.g., malignant cell removal), academic research (e.g., nanoparticle separation), industrial applications (e.g., reclaiming of rare earths) and environmental applications (e.g., sequestration of suspended solids) to name but a few. The use of acoustophoresis has been increasingly used in the last 10 years for the manipulation, separation or concentration of particulate matter in complex media due to its non-invasiveness, versatility, simple fabrication, easy operation, and convenient integration with other on-chip units. This “label free” method has allowed the separation of micrometer biological cells from complex biofluids depending on specific sizes, densities and compressibilities. The use of high flow rates (up to L/h) in microfluidic devices makes acoustophoresis more convenient than other sorting methods. In this blog article, FLOW-3D is used to closely examine the forces that act on the particles and their effects. To the best of our knowledge, this is the first explicit study of this phenomenon that focuses on the different force contributions. Figure 1. Numerical λ/2 channel stable pressure field analysis at t=0 (solid lined) and at t=T/2 (dashed line). 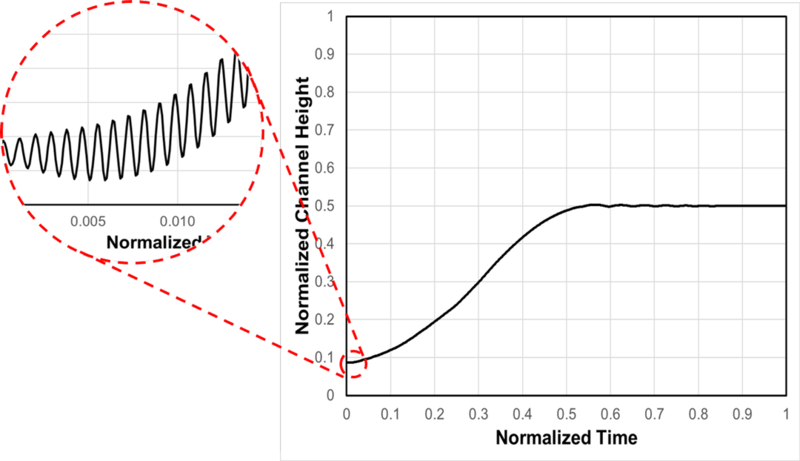 (a) Normalized pressure vs. normalized channel length, (b) Normalized pressure gradient at the direction of wave propagation vs. normalized length. For the purposes of this study, an elastic membrane (simple deforming object) is placed at the bottom of the computational domain (Normalized Length = 0) where it follows a prescribed oscillating motion that results in the generation of a standing acoustic wave. The oscillation frequency is carefully chosen so that the wavelength is twice the length of the channel. The force amplitude for the membrane’s oscillation is set high enough so that a pressure field maximum of the order of 1 Atm can be observed. A wall boundary condition that allowed for total wave reflection is placed at the top of the domain (Normalized Length = 1). Symmetry boundary conditions were placed on all the remaining boundaries. Initially, the fluid is at rest and its pressure is set at 0 Atm. At the onset of the simulation, the membrane begins to oscillate, generating amplifying pressure waves. We observe that the pressure extrema reach stable values after approximately 1000 oscillations. Figure 1 shows the pressure field and pressure gradient once these stable operating conditions have been reached. More specifically, Fig. 1a verifies the existence of a pressure node at the middle of the channel. Figure 2. Exposed to the pressure field shown in the previous figure the particle was moved to the center of the channel after more than 1000 periods. Each oscillation is modeled and their cumulative effects lead to the particle's overall motion. It is important to note that the absolute values of the pressure maxima at t=0 and t=T/2 are higher that the absolute values of their respective minima. Therefore, since the pressure waves do not cancel each other out, particle focusing is possible. Moreover, the pressure gradient along the direction of propagation, shown in Fig. 1b, reaches a peak value at the location of the pressure node. A probe particle was also placed at a random location in the computational domain. As shown in Fig. 2, the particle moves, in phase, with each membrane oscillation while approaching the center of the domain. The results of this preliminary study were extended into a simulation of free flow acoustophoresis where particles enter the computational domain at an off-center location in a microchannel of 500μm height and 2mm length. Under the influence of a standing acoustic wave at a frequency of 1Mhz, the particles are focused in the middle of the channel. The following animation shows the particle motion through the course of 4000 periods. The absolute pressure is plotted as a fluid variable to help illustrate the location of the center node. Lin, S.-C.S., X. Mao, and T.J. Huang, Surface acoustic wave (SAW) acoustophoresis: now and beyond. Lab on a chip, 2012. 12(16): p. 2766-2770. Petersson, F., et al., Free flow acoustophoresis: microfluidic-based mode of particle and cell separation. Analytical chemistry, 2007. 79(14): p. 5117-5123.